PolitiFact retracted a fact check and issued a second ruling Wednesday after it missed importance evidence backing up a campaign ad attacking Sen. Claire McCaskill (D., Mo.). The Republican-aligned Senate Leadership Fund released an ad Tuesday called "‘Normal' MO," which attacked McCaskill for her use of private planes and portrayed the Democratic senator as out of touch with the average Missourian. "Claire even said this about private planes," the ad's narration says, before showing a clip of McCaskill saying "…That ordinary people can afford it." 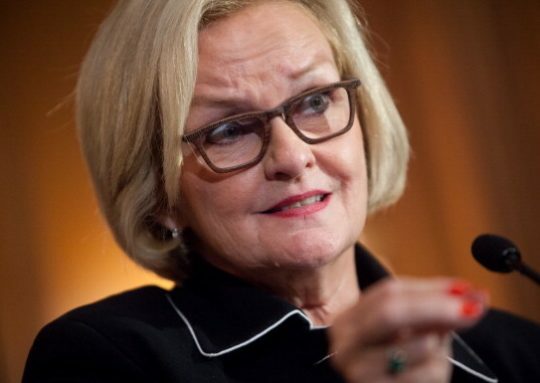 In its initial fact check, PolitiFact ruled the ad's claim was "False," writing, "Did Claire McCaskill say normal people can afford a private plane? No." The video in the ad was taken from an August 2017 town hall in Kennett, Missouri. At the time, PolitiFact could only dig up 18 seconds of video from the town hall posted by the National Republican Senatorial Committee. In it, a constituent said, "You know, that’s one thing the United States has that nobody else has, is the freedom to fly around and be affordable where a normal person can afford it." "Will you remind them when they come after me about my husband’s plane that normal people can afford it?" McCaskill responded. Based on that clip, PolitiFact surmised that "the audience member never said anything about private planes in the clip; he appears to be referencing the freedom and low cost of the overall U.S. commercial aviation system." But in contemporaneous remarks to the Washington Free Beacon, McCaskill made it clear she thought the man was talking about private planes. "He was just a regular guy and he has a small airplane," McCaskill told reporter Brent Scher a week later. "I was speaking to his concern that … it was going to be way too expensive for some folks to be able to use their small airplanes." Hours after publishing the fact check, PolitiFact pulled it down and announced on Twitter that it was re-evaluating "new evidence." Republican critics pushed back against that claim and the "Half True" ruling. "If you want to read what an actual news organization without a political agenda had to say about this, here's what [St. Louis Post-Dispatch] wrote on this a year ago," NRSC deputy communications director Bob Salera tweeted. In the linked Post-Dispatch fact check, the paper ruled McCaskill was "generally agreeing with the premise that a ‘normal person' can afford to fly a private plane — a premise that might make many normal people balk." This entry was posted in Politics and tagged Claire McCaskill, Politifact. Bookmark the permalink.